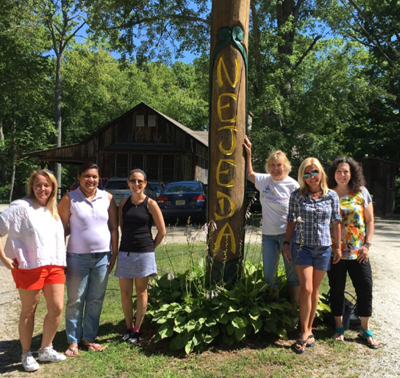 Employees (left to right) Laurence Roux, Jay Subramanian, Elyse Grosman, Lucy Walsh, Rachele Berria and Anne Gorman gave Camp Nejeda some much-needed volunteer support this summer. Part of the fun of camp is seeing your buddies summer after summer. Sanofi US employees are those kind of friends at Camp Nejeda, the only camp of its type in New Jersey and neighboring areas; many return each year and bring their family and friends to help, too. On four Sundays this summer, 20 employees handled the check-in paperwork so counselors could be in their cabins meeting and greeting the campers and their families. American Diabetes Association Teen Adventure Camp, Ingleside, Ill.